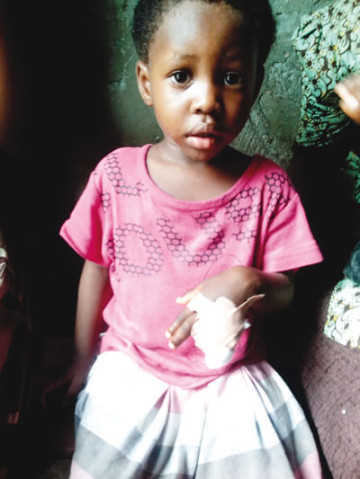 The Sabo Police Station on Tuesday arraigned a 49-year-old pastor, Moyo Martins, before a Yaba Chief Magistrate’s Court for allegedly cutting off the fingers of a two-year-old child, Saidat Faleye. The incident happened on Olumo Street, Iwaya Onike, Yaba, Lagos State. It was learnt that the mother of the victim, Mrs. Bola Faleye, had left her in the care of Martins on Thursday, when she wanted to take her bath. After she was gone, the child and the suspect were said to have been together in his room. About five minutes later, our correspondent gathered that the child suddenly let out a loud shriek of pain which drew the attention of neighbours. They reportedly alerted her mother who equally rushed to the scene in panic. She found her child’s ring and little fingers chopped off. It was alleged that Martins sawed off the fingers in his room. The kid was said to have been rushed to a hospital within the area for treatment. The suspect initially denied knowing anything about the incident. However, upon his arrest, he allegedly confessed that he did it in error and pleaded to be forgiven. The police prosecutor, Mr. F. Ifijeh, said the offence was punishable under Section 243 of the Criminal Law of Lagos State, Nigeria, 2011. The defendant pleaded not guilty to the charge and elected summary trial at the magistrate’s court. The Chief Magistrate, Mrs Y.O Aje-Afunwa, admitted him to bail in the sum of N100,000 with one surety in like sum. The matter was adjourned till April 24, 2014.